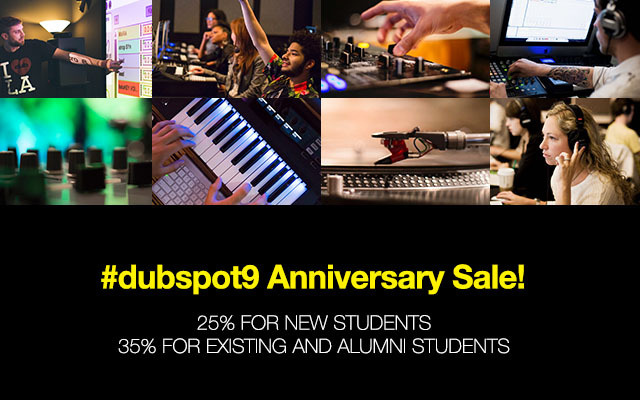 On Tuesday June 23rd, Dubspot celebrates its nine-year anniversary as one of the world’s leading learning environments and community of musicians, DJs, producers, visual artists, audio professionals, and enthusiasts of all genres. Check out a few of our notable accomplishments and take advantage of the years biggest sale as we move forward into another great year of music. Over the past nine years, Dubspot has grown from one classroom in New York City into a global community connected through the focus of music education. Today our studios in New York and Los Angeles offer the latest in music production technology along with a staff of instructors who bring real word experience and insight to the classroom. Dubspot has also grown into a brand that is synonymous with modern music production and education. Our video tutorials, written articles, event coverage, and workshops continue to connect an interested public with knowledge on the latest hardware, software, and workflow techniques. In 2010, Dubspot Online was launched to bring the school’s unique curriculum and focus to a global audience. Our mission at Dubspot Online is to help you expand your knowledge of music and technology so you can bring your creative visions to life. We offer programs in Music Production, Sound Design, Mixing and Mastering, DJing, and Music Foundations. Our innovative curriculum helps you learn how to create and perform your music using state-of-the-art software in a top-notch faculty of professional DJ/producers, musicians, and engineers. Like our courses in New York City and Los Angeles, our online courses are focused on your creative and musical progress throughout your time with us. Each week’s video class material introduces new concepts to apply as you work on creating original sounds and music. Then you will submit your projects and receive feedback from your teacher and your classmates. Along with class discussion rooms, online office hour sessions and video hangouts twice a week with your instructor, and in-depth video lessons, Dubspot Online can provide the knowledge and guidance you need to advance your music. In 2014, we introduced Blended Learning – a concept that infuses our brick and mortar curriculum with our online curriculum and convenient access to educational videos, 24 hours a day, 7 days a week. Blended Learning provides students the opportunity to enhance their learning and experience many of Dubspot’s learning resources. In addition, students have even more workshop activities with instructors, collaboration opportunities with peers in the classroom, access to reference complex material in the comfort of their own studios, and much more. In addition to the classroom experience, Dubspot also hosts many free workshops, lectures, demos, and events that bring our unique learning experience to the public. So far this year in the United States we’ve hosted events in Los Angeles, New York, Las Vegas, and Austin. We’ve also hosted International EDU sessions in Brazil, Germany, Japan, and Spain.